My thoughts on this column were simple, my notes are scattered all around me and not really in any scientific order. This will be a place to jot down my thoughts as I examine new items and receive new information. The test of time will be if I can continue to remember to put them all in here and keep this updated. In the 1950's when the Amy was thinking about doing away with the bayonet and the adoption of the M-14 rifle, they did a test on knives. Several were made up based on the M3 blade profile with plastic type grips, but double edged blades. They are shown in Cole IV pg. 107. The standard they were judged against was..............,you guessed it, the USMC fighting /utility knife. When the test was concluded, the non test item, the k-bar, was declared the winner; and it wasn't even in the test! The Army Infantry Board thought it was a better knife. During WW II the M3 was adopted due to steel stocks on hand, the proper size, cutlery machines able to handle that size and a significant steel savings on 2.5 million knives, not because it was the best candidate. Eventually the Army decided to stick with a bayonet so the point became moot. 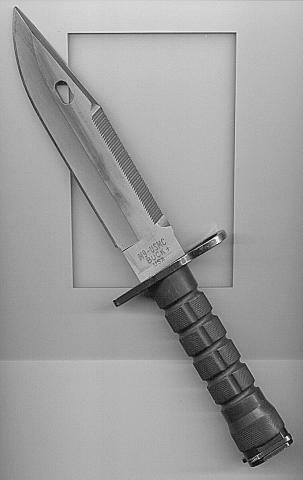 But they did procure the k-bar type knife for the infantry during the Vietnam War as it was a standard DOD knife and easy to procure without any hassles. 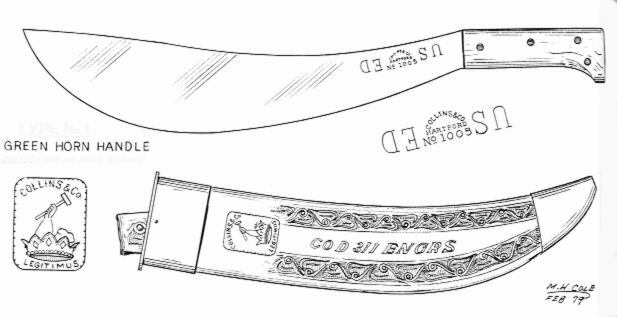 According to Kabar they had been trying to sell the USMC on this design since the Corps put out a bid for a field knife in 1941. At that time the Corps decided on knives made by Camillus for field issue. They are not in any books, such as Cole's, and known by only a few collectors. It was actually nothing more then a slab sided hunting knife on the first large purchase. Camillus called them the #5665 hunting knives. Camillus supplied thousands of them. Camillus also made three separate designs for the USMC Para-Marines known as the J12, J13 & J14 models with "J" being for Jump. Not made in large quantities, they are very rare to find and, again, not pictured in any books for me to refer you to the pictures. 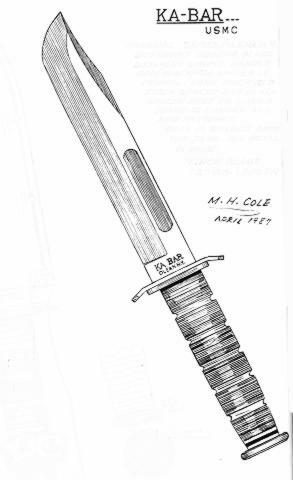 The Marines then went to the Western parachutist knife for the sky boys, and these are featured in Cole's book. All the while Kabar was working on a machine to shape the leather handles without human help. They needed to accomplish that before they could commit to heavy production. The red spacers were in the handles to help the human hafter on the grinding to prevent marring the guard and removing the finish. The first design was made in sample amounts in 1941. 1942 started with larger amounts being purchased but still no official approval. It was still in the test and development stage. The final approval came in late 1942. 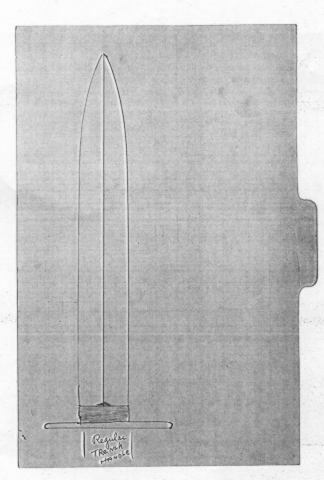 The familiar blueprints seen on the current Ka-Bar box show the third redesign. This can be seen on the blueprints as 1219C2c dated 9 Dec 1942, with the "c" designation being the numerator but keeping the Official adoption date as 23 Nov. 1942. The Red Spacer Ka-bars should be in leather scabbards with small round head rivets. These were superceded with the staple design. The Marines never did adopt the hard scabbard although they did test it. Anyway that's what I have put together from research over the years. A knife recently obtained from fellow member Mike Silvey has piqued my interest. We know what a "Delta knife" looks like from drawings and photos, but we have yet to discover who made them. The Steffens knife closely follows the handle design of the Delta knife but has a different blade profile. The clue we hope to link the two together with is the stamping in the blade. Who was Steffens? Did they make the Delta Knife? Are they still in business; and, if not, when were they? Sure are a lot of questions, but we hope some of our readers just may have an answer to our search. As always, thanks in advance to any answers. Another recently discovered knife is a 7" Marbles Ideal. It has a seven groove leather handle with a jet pilot's pommel. The blade is marked "Marbles / Gladstone / Mich, U.S.A." and the full cross guard is made of brass. Placing this knife next to a typical Mark 2, one immediately notices the striking similarity. Not being a dyed in the wool Marbles collector, maybe it is a typical knife; but it is the first and only one I remember seeing. It turned up at the Oregon show and was quickly snapped up. Lucky collector! Any further info available on this one? In talking with Charlie Ochs of Ox-Forge, we discussed his Auto versions of the Black Knife. Thousands have been made since the initial inception of the pattern, and it is a well made and highly respected knife. We started talking about variations on the knife itself. It seems that the knife to find is the painted camouflage version. The parts were supplied to a shop that specialized in painting camo hunting bows. Altogether he produced three dozen of that painted pattern. 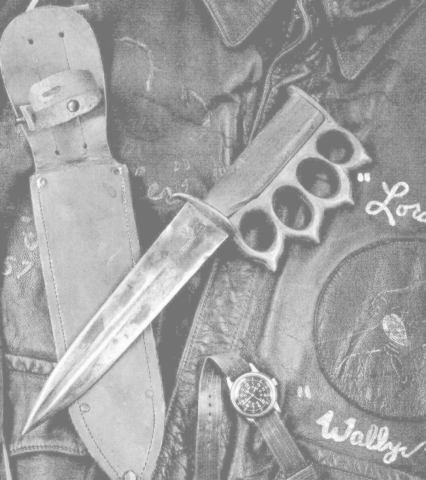 With 36 knives available when they were made, I wonder how many still exist as they were made to be used. Black knives are cool, but camo knives are RARE! The SRU-16P kit holds the smallest military knife issued at 3 1/4" long. It is part of a personal survival kit in a parachute harness pouch. The kits are not accessible until the parachute has been opened and are generally considered one time use kits. The SRU-16P has been in service since circa 1960 with little change to its contents. 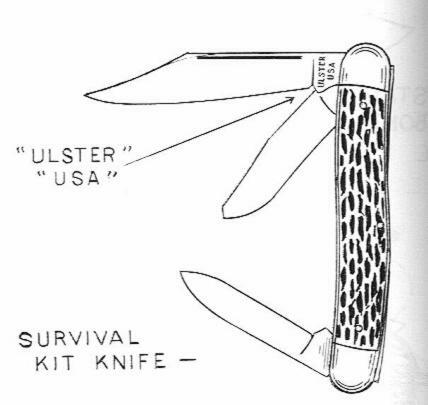 I have seen knives made by Ulster and Colonial in these kits over the years. That's not the case today. 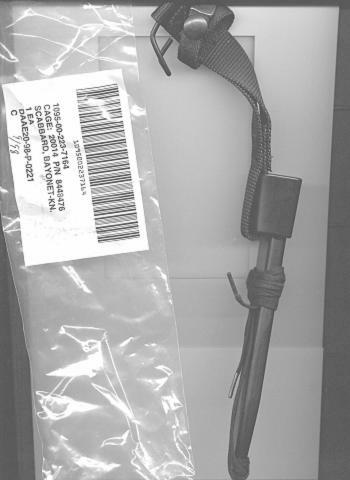 The current SRU-16P kits contain knives made in Pakistan. From what I am told, these knives are better then the knives they replaced; as they were made in China! Now one can't expect much from a 3" long knife; but in a situation where they may be needed, I would like to think our men have the best items available to do the job. This is a case of the "lowest bidder" syndrome that has no place in survival gear. They may be perfectly well suited to perform the tasks they are called for, but in my opinion they need to be made in the good ole USA. Unfortunately my opinion does not count. It's what is known as a VEP, a "Value Engineering Proposal." A study was undertaken to determine if the sharpening stones in the scabbards were necessary or not. With the stones being commonly broken and lost, it was becoming very expensive to renew the stones on a consistent basis. In steps the VEP. We know the outcome, as the stones were eliminated on the scabbards; but I thought it was funny that the benefit to the govt would be a savings of $190,000.00 in the first year of not replacing the sharpening stones. I'm in the wrong business! The latest version of the U.S. Military Knives, Bayonets and Machetes Fourth Edition has hit the market. This time we have added a military machete section. It follows the same format as the previous editions, referring to published works for reference items to keep cost low. It's a must have for your reference collection. Available from Knife World Publications. A "1904" dated bayonet is probably one of the scarcest items in the Krag bayonet family. There were only a total of 80 made in that year. I have personally only seen one and have only heard of two in private collections. Yes, it is one to be on the lookout for. 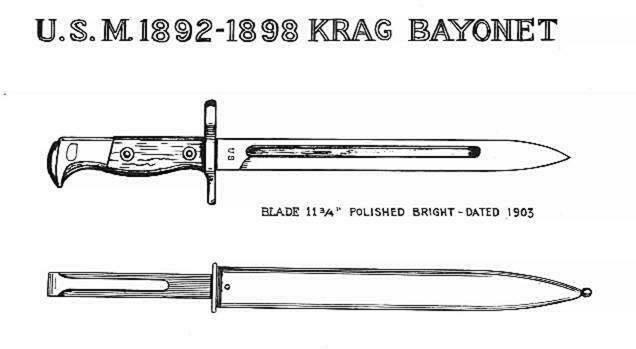 Prices have never been really high on Krag bayonets except for the bowie, bolo and cadet models. I don't think many folks know the significance of the 1904 model; so if you do happen to come across one, it could possibly be that sleeper you have been waiting for. While we are all familiar with the Phrobis and Lan-Cay made U.S. Army M9 bayonets, few are aware that the Marine Corps also purchased M9's. That's right USMC marked M9 bayonets. They were purchased for "division level field testing" and use by the 2nd Marine Division. As far as we know they are still in use. The original contract was put on an open bid, and Buck Knives won the contract. Buck was the original contractor for Phrobis; but, by the time of this contract (early 1991), they had parted company and were actually bidding against each other. This is the only group of bayonets made by Buck that are solely produced and supplied by Buck without the Phrobis connection. All the bayonets are of the Phrobis first generation style but have the Buck cutter plate on the scabbard. All of the blades are marked with M9-USMC and a plus (+) mark, as this is the Buck date code for 1991. Most of the examples hitting the street today have the webbing portion of the scabbard replaced. The original webbing was of the Phrobis style with the dual retaining straps. This webbing was superceded by the newer Lan-Cay style with the single retaining strap. As the bayonet scabbards began to show wear, the webbing used for replacement was of the type in the system; and this was the Lan-Cay design. Most scabbards still have the male portion of the guard retaining strap still attached to the body. Also seen are the engraving in the bayonets and the scabbards. 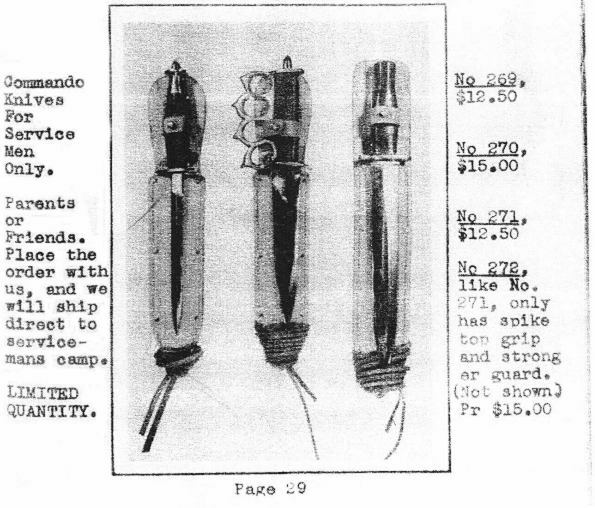 The M9's were marked to provide easy inventory and storage with an electric pencil. I have seen different markings, and all have been alpha-numeric (B-79 as an example.) Many of these bayonets are currently hitting the streets. Total numbers made were very low, 5000 in total. If the opportunity should present itself, grab one of these babies before they get away. In 1998 a contract was let for M7 bayonets by the US Army. That's right M7's! One might ask why M7's, as the Army switched to the M9 bayonet in 1986. Well, I never did find the answer; but I did find out something about the bayonets and the scabbards. The contract was won by Lan-Cay, but they passed the contract on to General Cutlery. As the contract was so small, Lan-Cay could not see setting up the necessary equipment to process that job. The total was for 1,300 bayonets. The contract was DAAE20-98-P-0041. The scabbard contract was for 10,700 pieces; but this too was passed on to General Cutlery, as the two owners of the companies were friends. The scabbards were contracted under DAAE20-98-0221. All the components were delivered by January, 1999. While externally it would be impossible to tell the 1999 contract M7 from any commercially built model, they are different. Army specs call for a dual heat treat, while the commercial models undergo a much cheaper single heat treat. The govt. specs call for a hard blade and a soft tang. Without a hardness tester, you can't tell them apart. But the scabbard can be spotted. For some reason the webbing of the scabbard has a single red thread running the length of the webbing. It passed the quality assurance test and was accepted into supply. It's another one to pick up if you see it. The last of the M10 scabbards procured by the US Army in the 1900's. WOW !! A recent auction set a record for a rare Savage M99 bayonet. The price went over $4,000.00 for the super example. Four grand for a bayonet seems a little steep; but that is the market today and it's getting better everyday. Excellent to mint examples demand high prices, but excellent or better RARE examples can have prices in the clouds. It is a very simple system of supply and demand. Savage M99 bayonet = Rare, Excellent condition = Rare, put the two together, and we come up with $4,000.00. Yep, seems pretty simple to me. A recent debate was held over the opinion of value concerning the number of grooves on an M3 handle. I am of the opinion that it matters to some. The casual collector who just wants one for his collection could probably care less. The "one of every maker" collector will probably go for a standard type model having six or eight grooves, not an odd seven or nine groove handle. The "one of every variation" collector will pay handsomely to acquire a version not in their collection, as will the "one of every version by a single maker" type collector. Well, that being said, here's one for you all to find. Camillus made at least 18 full double edged M3's during the War for samples. They have the standard leather handle, marked bent guard and a double pinned pommel. I haven't seen one in person, but one is shown in the M3 booklet by Coniglio & Laden on pg. 37. I have recently received the prototype drawings of them, and they are reproduced here. Does anybody out there have another one of these rare birds? It is a Lan-Cay prototype developed for the US Marine Corps. Unlike the typical M9, the prototype bayonet has a solid tang and the pommel is actually welded to the tang. The 2-piece grips are identical to those of the US M7 bayonet, except they are OD green. Yes, green. I am not aware yet of the total number produced for testing but assume very few were made. The blade is marked "M9 - XM" / "USMC" / "LAN CAY" on the reverse ricasso. The scabbard is the normal OD green M9 product with the "single hold down-simplified system" previously used by the USMC. I have also heard of similar examples of the M9 - XM with solid tang, but with the standard one-piece M9 grip. You heard it here first. I heard someone once say that we do not own these knives, we are merely the caretakers of them, preserving them for the next generation to enjoy. With that in mind I constantly see leather handles and sheaths in dry, brittle condition. Most are easily brought back to like new condition with a simple coating or two of a quality leather dressing. Keep in mind the product you choose to preserve your piece. The majority of leather dressings on the market today are based on tallow or neatsfoot oil. Tallows contain salts which build up with repeated dressing and attack the leather fibers. These animal fats provide a culture for the growth of bacteria and fungus, and eventually turn rancid, resulting in further attack on the leather. Products that use animal fats include: Mink Oil, Lanolin based products and Neatsfoot Oil. Normally when they dry you can see the tell tale signs of a white powdery substance on the surface. I have had great luck with Pecard Leather Dressing. Their products are based on a petroleum lubricant similar to Vaseline. It is a dressing which penetrates the leather, allows the fibers to bend and move without chafing and breaking, coats the fibers to inhibit oxidation and helps maintain a desirable level of moisture in the leather. It is chemically neutral, so it will not darken leather, but restore it to its natural-toned color. It contains neither salts nor solvents and does not decompose as animal fat products do to form damaging chemicals. Leather is a protein and needs these oils replenished to prevent it from drying out. As for the general consensus on alterations................. as long as it is a treatment to enhance the life of the item, all is well. There are those who do not believe anything should be done, but I disagree with this thought. I have found many great knives over the years with slightly loose guards that have been brought back to Excellent Plus items by having the leather handles treated which swells the leather back into the original size tightening up the guard again. This week past I had the pleasure of holding and photographing a Woroniecki knuckle knife. 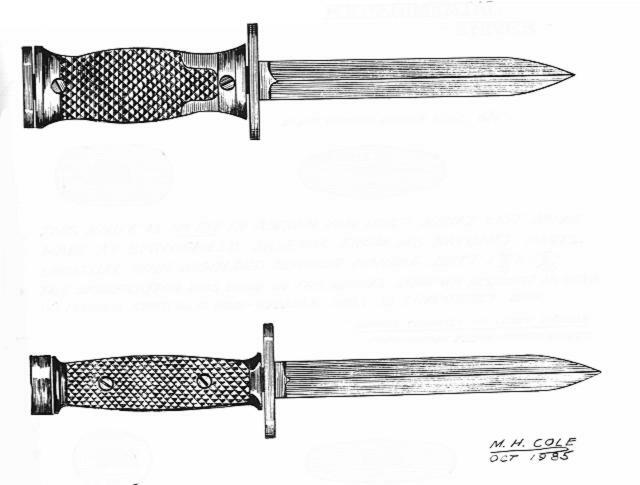 I have seen these knives in books before, both photographed and illustrated. I have recently come across a copy of a page from the wartime Woroniecki Rare Guns Catalog dated 1944. It shows three variations of knives offered, and a fourth is listed but not shown. I can't remember ever seeing them before in print so here is that photo. Sorry, it doesn't reproduce well; but it is a copy of a copy. I do remember seeing a V-42 type knife in a display at one time that I assumed was a theatre made type. Now that I think of it, it may have been a Woroniecki knife. Anyway, for your viewing pleasure, here they are. Knowledge is power when you know what it is you are looking for. Now the big question...... who were they made by?? Just a quick note that the U.S. Navy SEAL TeaM Five purchased 100 Buck Model 187 Intrepid Tanto style knives directly from Buck. These knives featured the older style (1998) serrations that Buck has since changed in 1999. The SEAL's received the 100 knives in May of 1999 with the possible future purchase option of 100 more left open. What are they being used for ............ Your guess is as good as mine at this time. We shall try to poke around and see what turns up. It seems the SEAL's can never get enough knives. My kind of guys! In researching the M1917 Trench Knife, I noticed a section in an Ordnance pamphlet entitled "Handbook of Ordnance Data" dated November 15, 1918 printed by the GPO in 1919 that described the M1917 Bolo Knife. It stated that these bolos were produced by the American Cutlery Company, Fayette R. Plumb and the Bartlett Edged Tool Company. I have viewed dozens of the first two but cannot remember ever seeing one of the latter made models. Do they exist? Is it a misprint? Could it have been mistaken as to which product Bartlett actually made? The unmarked bolo similar to the Collins 1005 has never been attributed to any maker, could this have been the Bartlett product referred to in the Ordnance pamphlet? All guesses so far, but it does give one something to ponder on. I never really paid much attention to them, as I really specialize in United States military knives; but I have always liked the F/S knives. Well, I happened upon a few that were in unissued condition and still had the cosmoline on them from WW II. This grabbed my attention. I often wonder how such things can stay in storage for 50 years and just surface now? I guess it's like some of the stuff in my garage. I have moved across the country several times, so much of the stuff packed in there is still in boxes! I couldn't tell you what is in some of those boxes! Anyway I digress, these knives were in excellent plus condition, having only light storage marks on them, preventing them from being classified as mint. When I examined them, I noticed a small number stamped on the hilt, FR693, and a number stamped on the rear of the scabbard, FR271. Having remembered reading something about them, but not remembering enough to be sure about it, I purchased two. I pulled Ron Flook's book off the shelf and started to read again. Here they were and said to be rare! Some days it be like that. Did you know that Case did not do the bluing, parkerizing or plating on the V-42 of WW II fame? That's right; they sent them out to have that work performed. The parkerized versions were done by the Olean Plating Company of Olean, N.Y. The blued versions were done by Robinson Cutlery Company of Springville, N.Y. There is no record of the few samples that were plated bright, but Case used Olean Plating Company for the bright plating of their 325-5 and 325-6 models during the war. If I were to bet, that would be the place. While on the topic of Case, did you know that the U.S. Naval Air Station in San Diego ordered and received 30 Case knife/axe sets in 1943? It was listed under a local contract number of "26376" and delivered in mid 1943. First I ever heard of that one! Testing I would suppose, but maybe they had a few trees on the base that needed to be taken care of. We will probably never know about that one, but they did buy them and receive them during WW II. Copyright (C) 2001 Oregon Knife Collectors Association. No part of this article may be reproduced without permission of the OKCA.